The latest addition to the Gundle range of products is the Durafoil insulation membranes. These membranes are all aluminium foil laminates and conform to the SABS 1381-4 specification covering material for the thermal insulation of buildings. The polyethylene bubble layer for additional insulation. The product is aesthetically pleasing and attractive when applied under metal roofs. Insububble can be used under domestic or industrial roofs. It is flame retardant, tested in terms of SANS 10177 the product has been classified as class B/B1/2/H which means it has a superior flame retardency and can be used in any structure with a B1 rating with sprinklers. The product has been tested with sprinklers. Insububble has a strong tear-resistance and will not expand when in contact with changing roof temperatures as in the case with other bubble type insulation membranes which consist mainly of polyethylene layers. Insububble is dimensional stable and easy to work with. Durafoil DSD is a 6 layer laminate consisting of two outer layers of aluminium foil, one layer of spunbond, one layer of reinforcing scrim and two layers of laminating polyethylene. It is a top of the range product and carries the SANS 1381-4 Class A mark certification. The reinforcing scrim provides additional strength and stability making the product ideal for industrial applications. Durafoil DSD has a B/B1/2/H fire rating which means it has a superior fire resistance and can be used in any structure with a B1 fire rating with sprinklers. Durafoil Ultra Double Foil is a 5 layer laminate which carries the SANS 1381-4mark Class C. It has been used extensively as an insulation membrane under tiled and metal roofs. The aluminium foil layers provide insulation, the top layer through reflectivity and the bottom later through its low emissivity. There must be an air space of at least 50mm for the reflective surfaces to function efficiently. The product does not need to be scrim reinforced as the spunbond layer provides adequate strength and stability. The product will also act as a dustproof layer when used under roof tiles and has excellent vapour resistance. 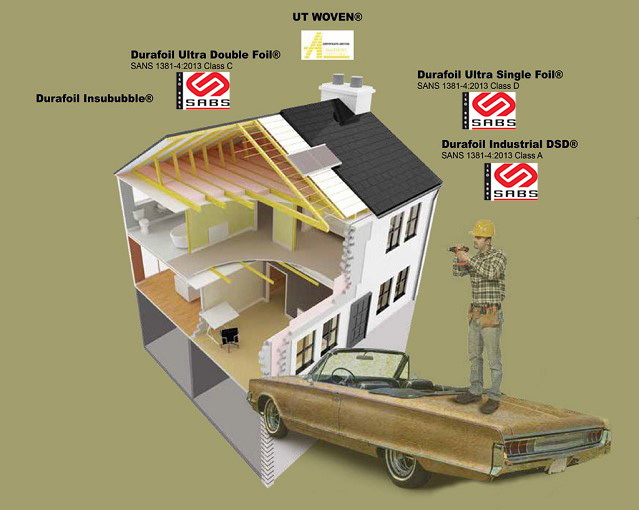 Durafoil Ultra Single Foil has been developed specifically for use under roof tiles and is certified under SANS 1381-4 Class D. The aluminium foil later will not radiate or emit heat downwards and the product is applied with the aluminium surface facing down towards the interior of the building. The spunbond membrane gives the product substantial strength and stability. Durafoil Ultra Single foil does not have foil on the section of the membrane which acts as the overlap; this reduces the cost of the membrane as the section where the membrane overlaps the layer underneath makes the foil surface ineffective as it needs an airspace to function as an insulator. Other than insulate the roof space the membrane will reduce draughts and dust penetration into the roof area. The membrane is also designed to prevent moisture from damp air from condensing on the ceiling boards and other vulnerable points in the building fabric. Most home loan institutions insist on the use of an under-tile membrane where the roof pitch is less than 26 degrees or more than 45 degrees and also in exposed coastal areas as the membrane will prevent strong winds from ripping off roof tiles. UT Woven ® is a new woven polypropylene membrane that has been specially formulated for use under roof tiles. It is 350 (micrometer) in thickness and made in rolls of 1,5 x 30m. UT Woven ® is dimensionally stable, light in weight and weatherproof; handling and installation are easy, and will seal around nails. It is used for the prevention of draughts and dust penetration into roof spaces through tiles, and prevents damage to ceilings, rotting of timbers and corrosion of plumbing. Dust has also been known to penetrate between cornices and walls, initiating or aggravating allergies in susceptible people. The membrane is also designed to prevent moisture from warm damp air reaching and condensing on the ceiling boards and other vulnerable points in the building fabric. UT Woven® also prevents strong wind from lifting and ripping off roof tiles. Most home loan institutions insist on the use of under-tile membrane where the roof pitch is less than 26 degrees or more than 45 degrees and in exposed coastal areas. One layer of UT White® weatherproof sheeting, installed over common rafters and under battens to receive tiles. Allow a minimum overlap of 100 mm. Boarding to be used at the open eaves to carry the UT White(r0 to the gutter. The boarding gives added security to the structure because it prevents wind-lift of the tiles from the underside of the open soffit. Turn down the UT Woven® over the fascia board at the eaves and seal into the gutter. The material equalises the pressure and complements the function of the roof tiles. It is flexible and easily handled. It is used for the prevention of draughts and dust penetration into the roof spaces through tiles, and prevents damage to ceilings, rotting of timbers and corrosion of plumbing.